Okay, so we didn’t drink this champagne at school. It was at the start of our Wednesday night celebration. 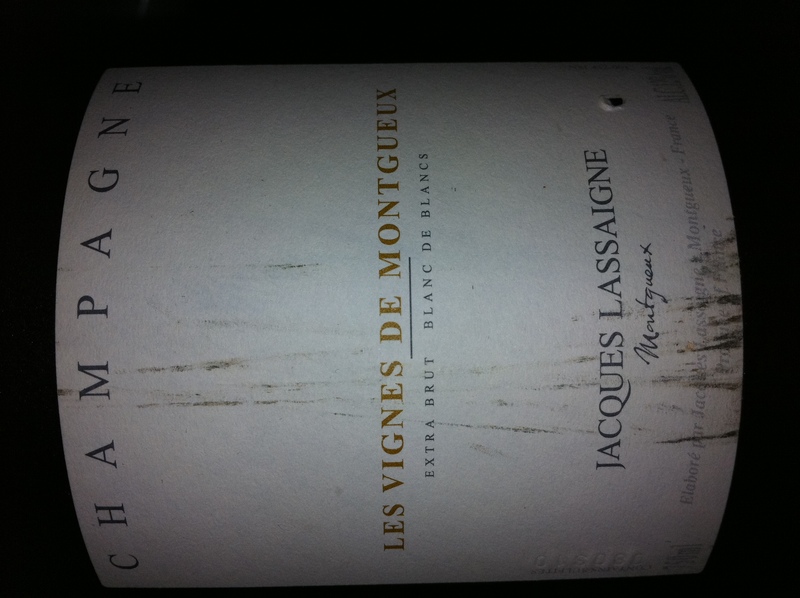 If you can find this champagne, I highly recommend buying it. In a world where champagne has become so commercialized and additive’d, thanks in great part to the U.S. palette and the CA sparkling wine producers, this champagne is a true gem. According to Chris at Bambino, it’s done in the “old style”, natural way in Champagne and it’s affordable compared to many others of its caliber. It was a knockout. The last two bottles of the night we had were Italian reds, both incredible. The Dorigo hails from the eastern hills of Fruili, in Italy’s northeastern wine region of Friuli-Venezia Giulia. 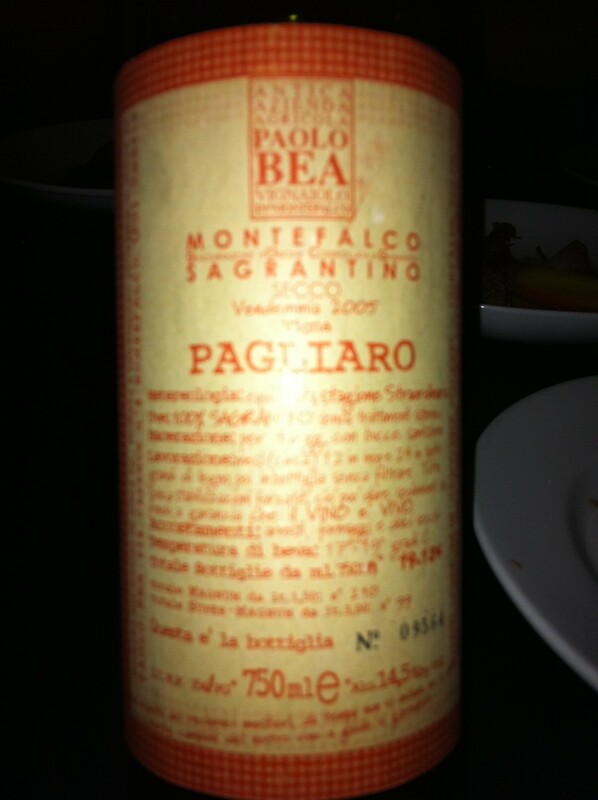 The last wine of the evening (before the dessert wines) was Paolo Bea Pagliaro Secco, Sagrantino di Montefalco. Grown around the town of Montefalco is the native black grape Sagrantino, and the wine is required to be at least 95% Sagrantino and aged for 30 months. This is a dynamite and complex red. Pictures of both bottles are below. Okay, I digress. Thursday was the start of Level III, which is cooking every day, under time pressure, and adding dishes to the time pressure, all in anticipation of the midterm at the end of the Level III in which an outside panel of chefs rates our midterm meals that each student produces individually. It’s pass or fail and it has to be nearly perfect in both presentation and taste. Some serious pressure. 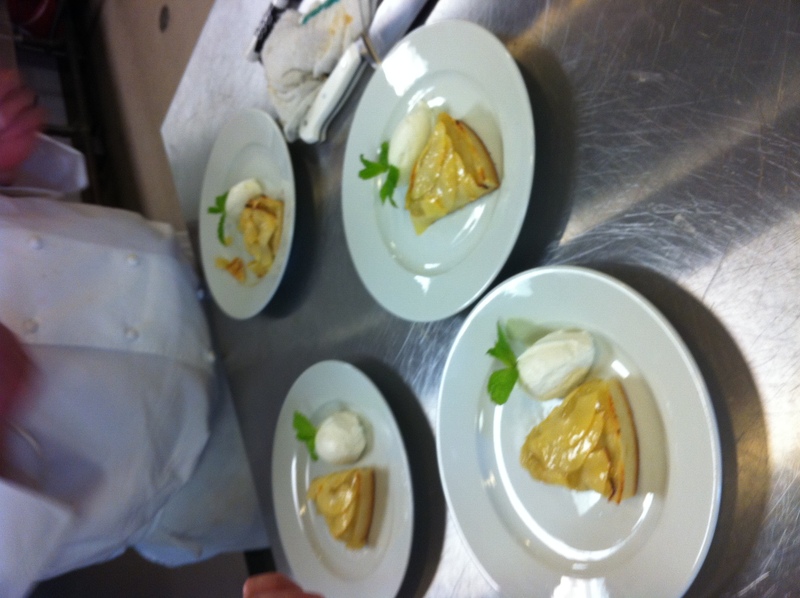 So, Day 1 of Level 3, each of us to had to execute 1 1/2 dishes at different intervals; Day 2 it was 2 1/2 dishes. Day 3 (Monday), it will be 2 1/2 dishes, and likely in less time. 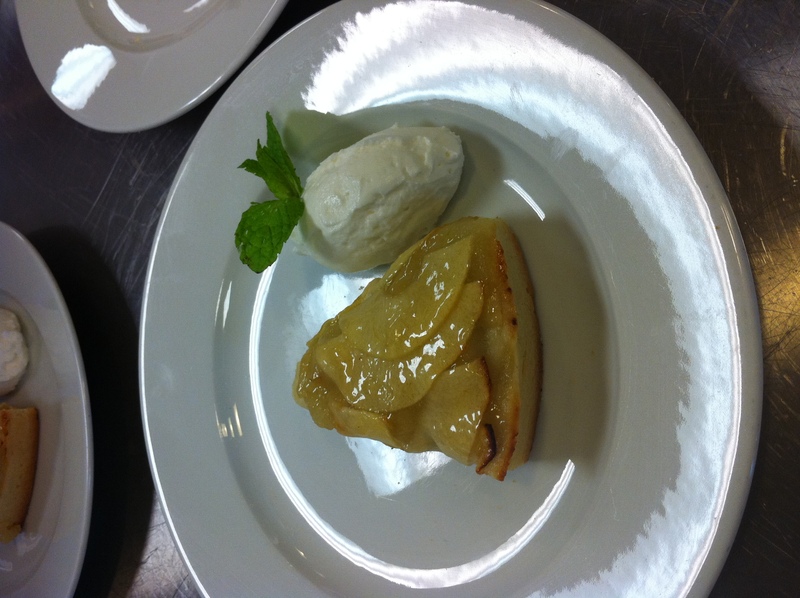 On Day 1, I filleted two trout, made 4 dishes of crispy skin trout with a grenobloise and potato cocottes, plus Anne, Ian and I collaborated on an apple tart. On Day 2 (Friday), I made 4 amuse bouches of seared scallops atop a brown butter/lemon sauce, and topped with macedoines of yellow and red/purple heirloom tomatoes in olive oil, lemon, salt, pepper and parsley. I forgot to take pictures because I was in a hurry. 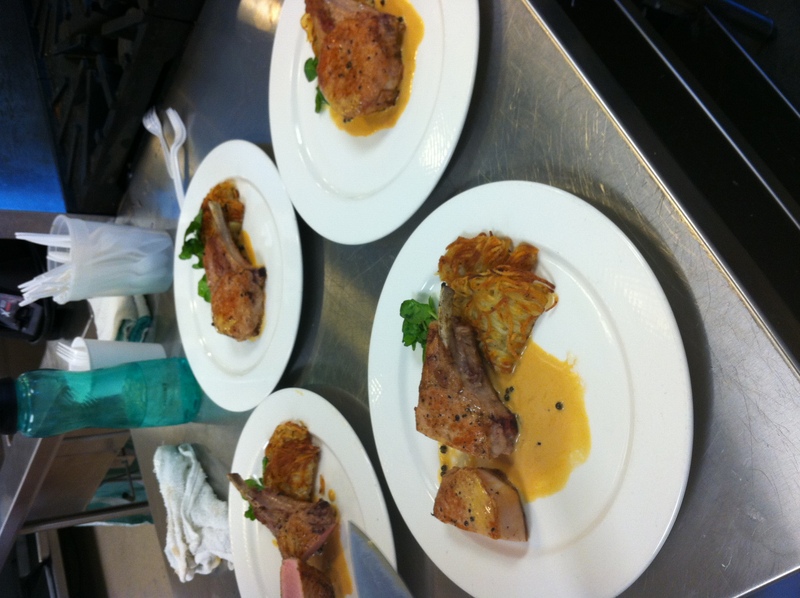 Then, I made 4 dishes of thick cut pork chops and pommes anna, and we all collaborated on the beef consomme. Pictured below are my pork chops, up close and the 4 dishes that have to be served simultaneously, as well as Ian’s apple tart pics. Tomorrow (Monday), I’ll make another 4 plates of amuse bouche from a “mystery box”, 4 apple tarts, and we’ll collaborate on the trout (which I’ll fillet). I hope we get fish again in the mystery box, as that’s where my strength lies. Tonight, I’m cooking the pork chops and an apple tart for Carnet and Igor, as my pork chops were not perfect and my sauce looked kind of like barf, I’ll admit. 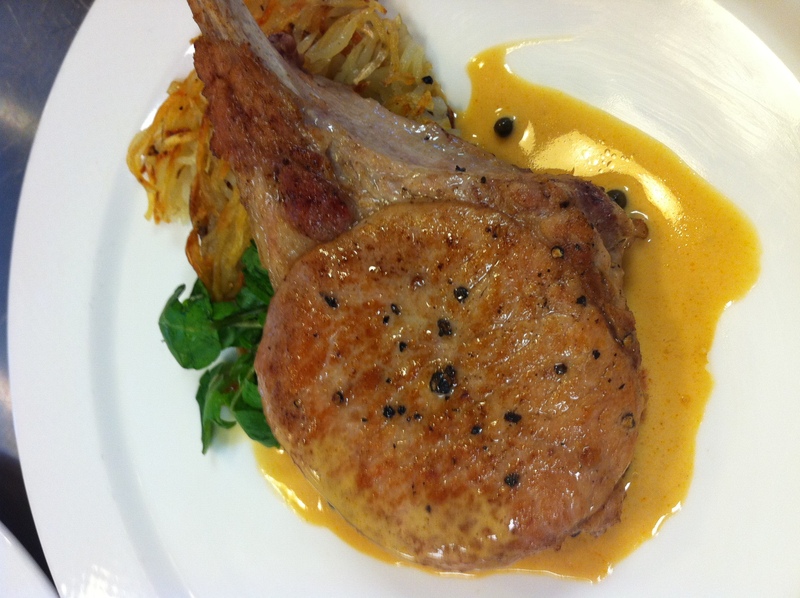 I added too much cream and took away the richness and beautiful color of the veal-green peppercorn sauce. So, tonight, I plan to make it better! But, I’ll pair it with a fennel, zucchini and ricotta salata salad as the first course, as the peppercorn sauce for the pork is pretty rich (but of course, it’s French!). 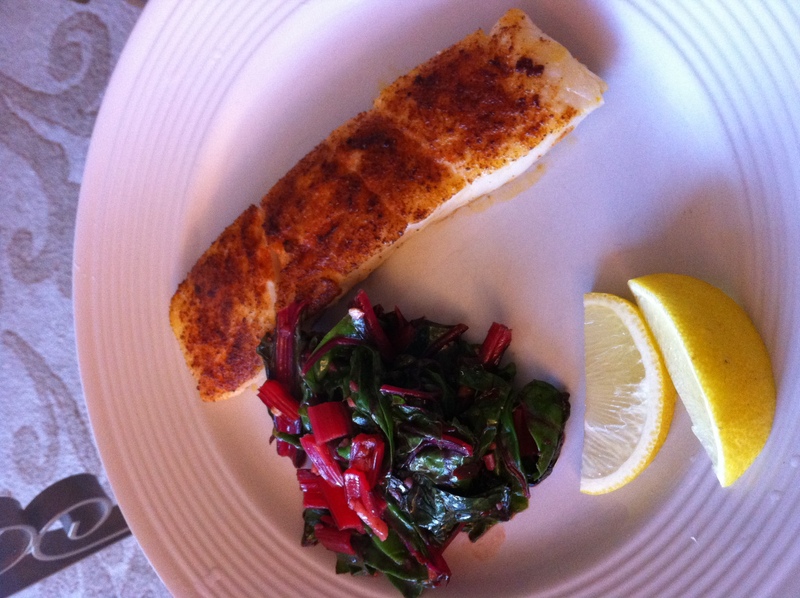 And, because I love taking pictures of food, here’s what Carnet and I made last night: seared halibut, with some greens and lemon wedges. We were in need of some lighter fare, following another big night of food. Friday was date night with Carnet at Benu. We’ve been trying to go for months, but due to his schedule, we couldn’t make it happen until last night. The decor was very smart – they actually had carpeting on the floor and that did a lot to “soften” the noise level. Bravo on that front. Also, Bravo on the service. In fact, that might be the best service we’ve received anywhere. Our main server even took me back in to see the kitchen, which had an amazing design. I’m not going to post my review of the food here; if anyone’s interested, I’ll be happy to talk to you about it.